The winner of the prestigious award Nordic Chair of the Year 2014 is Kari Jordan Metsä Board. 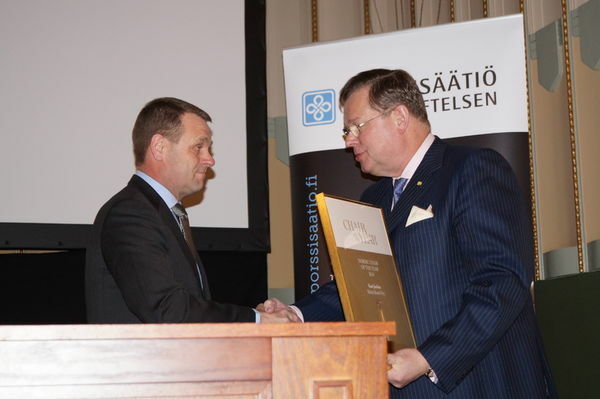 Minister of Industry Jan Vapaavuori awarded the winner at a seminar at Pörssitalo in Helsinki. Anitra Steen, Svenska Spel AB. Managed to make great profits in a market where social responsibility to gambling is a difficult balance. Ulla-Britt Fräjdin-Hellqvist, Kongsberg Automotive asa. The company is operating in the worlds most competitive markets with profitability. Kåre Schultz, Royal Unibrew. Turnaround from crisis to profitability and bought Finnish competitor Hartwall in 2013. The reasoning is a long term turnaround since 2005 in an industry that has generated huge losses and overproduction. The pulp and paper industry is a branch with long traditions in the Nordic countries. The strategy around year 2000 was consolidation and acquisition of competitors to super large companies. The objective was that large units should create profit. For example Norske Skogindustrier asa in Norway bought companies in Europe, South-America, Asia and Australasia and got a global status. They are the 2nd largest in the world concerning newsprint paper and 3rd largest in magasin paper. It has been difficult to get synergi effects of all the acquisitions something Metsä Board experienced in 2005. Norske Skogindustrier has a reduced market cap of € 2 billion the last 7 years and today the market cap is only € 100 million compared to Metsä Boards € 2.000 million (€ 5,61). The Metsä Board share had its lowest value in February 2009 with € 2.94. Kari Jordan had no wood industry experience before he entered the chair in the boardroom of Metsä. His experience was from the banking business and these skills were important in the turnaround process. He could easier see the market potential in new products and innovation with no hang up in traditional production. In 2005 they chose a strategy to leave the paper production. During 2005–2014, the demand for printing and writing papers in Europe has declined by approximately 30–35 per cent. The result was entering the packaging segment with new competitive products, fresh forest fibre paperboards. Kirsi Komi, born 1963, independent member, LL.M. 2013 Niels Jacobsen, LEGO Gruppen - Large growth the past years. In 2014 the largest manufacturer of toys in the world and the most profitable. 2011 Michael Pram Rasmussen, AP Møller Mærsk, The largest turnaround in Danish business life. Invested in the largest container ships in the world. 2010 Carl Bennet, Getinge AB. Built a global company with a strategy to be a market leader in the niches they entered. 2009 Risto Siilasmaa, F-secure Oy. Built an online security and privacy company for the digital world.